First, Starza’s tone was approachable and unpretentious – I felt as if, if I met her, I could sit down with tea and cookies and have a chat and not be uncomfortable. She is from the UK, so some of her spelling and an occasional reference might be different than what American readers are accustomed to. None of the women in the study group seemed to mind it. The author finds everyday things or customs that are magical in nature as ways to start each book. She helps you see the magic you’ve already done with candles and dolls before delving further into the subject – I’ll never look at birthday candles or teddy bears the same. Now, let’s take a peek at each book. Candle magic is probably the first magic I was drawn to do, but most of my learning has been intuitive with a few tips from others along the way. This little volume (just over 100 pages) is a solid introduction that looks at the different types of candles, safety, and more. The Daytime Wishing Spell worked like a charm! Starza take a good look at using different colors for particular seasons, elements, and so forth, however, she encourages the reader to use his or her own intuition and feelings about the colors and, later, other additions like scent. As a group, we tried her suggestion for creating colored candles from plain candles using melted crayons. It was a fun exercise (and worked well as long as you kept the wax hot) and a nice way to encourage people to be resourceful with what they have at home. Adding oils, herbs, and other embellishments are sections that have more fun ideas for those who like something other than plain ol’ candles. This first part concludes with a grimoire of spells to try out. Some are pretty simple, but you should not overlook the simple spells here. I tried two myself, and one of the simplest, the Daytime Wishing Spell, worked quicker than I’ve ever had a spell work! I wished that a publisher and an editor for two freelance projects I was working on would email me back. After performing the spell, I left home for several hours. That afternoon I returned home to success – they had BOTH emailed me back. In the second part, Starza focuses on ritual basics and how to use candles in rituals and celebrations. She also discusses the historic and modern use of sacred and eternal flames, which I thought was an unusual and thoughtful addition. 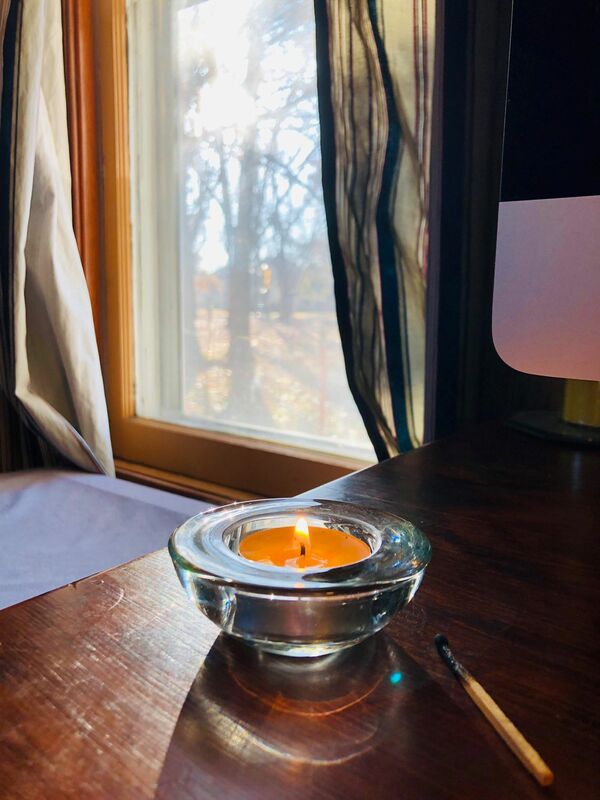 Rounding out the text are ways to use candles for meditation and divination, how to make candles, safety, and a brief history of candle making. Most of us grew up seeing or hearing the stereotypical view of a voodoo doll used to harm people. It was six or seven years ago at a Gaea Goddess Gathering workshop when I learned that these dolls are more often used as a tool of healing. 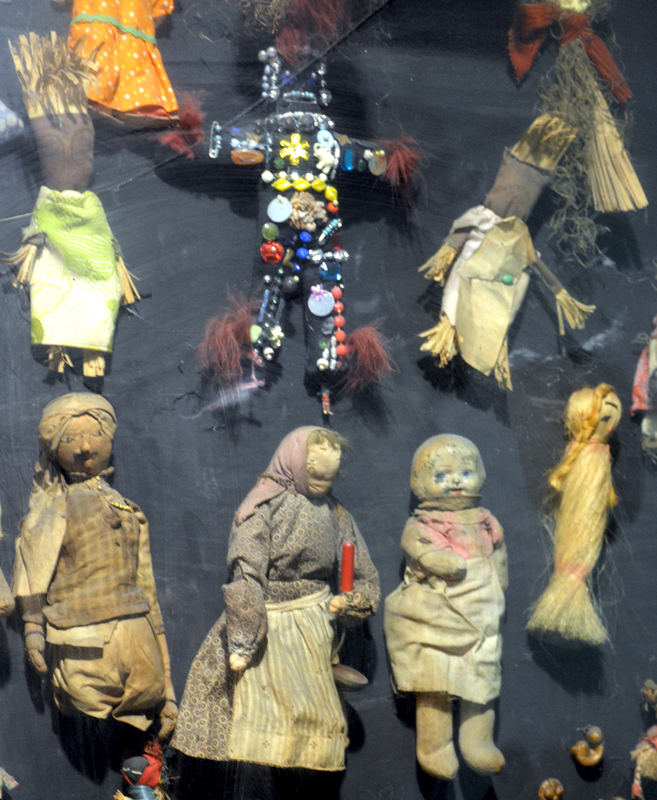 Starza whisks away the stereotypes of magical dolls, like these in the New Orleans Historic Voodoo Museum. Starza educates against this stereotype too. Her first order of business is to explore the history of this type of sympathetic magic, also called image magic, to show that many cultures have used dolls for a variety of purposes. This volume focuses primarily on using dolls to affect healing, luck, and moods, and even as guardians. One of my favorite parts of the book is where she explores the many different materials used to make the poppets. We so often are stuck in the idea of cloth dolls, but there is also clay, wax, natural materials, pipe cleaners, and even cookies. Yes, I said cookies. There are a couple witches I know that would be inclined to use modern craft clays. The author does eventually address the elephant in the poppet room: using pins. She explains that doing so is focusing energy where the pin is inserted, but this can be used for many purposes including healing! She follows up by touching on ethics and cursing before heading into ways to enchant, maintain, and use your created poppet. Decommissioning the poppet is also covered – something I’ve often seen left out of information about spell work. Wrapping things up is a section I found fun and fascinating that covers dolls and spirits, seasonal dolls of the British Isles, and doll magic around the world. Like most Pagan Portals, this is a slim volume but it’s packed with good stuff. As noted, these are short introductions that are great for beginners. They are friendly in tone and succinct and yet are creative and interesting to read. 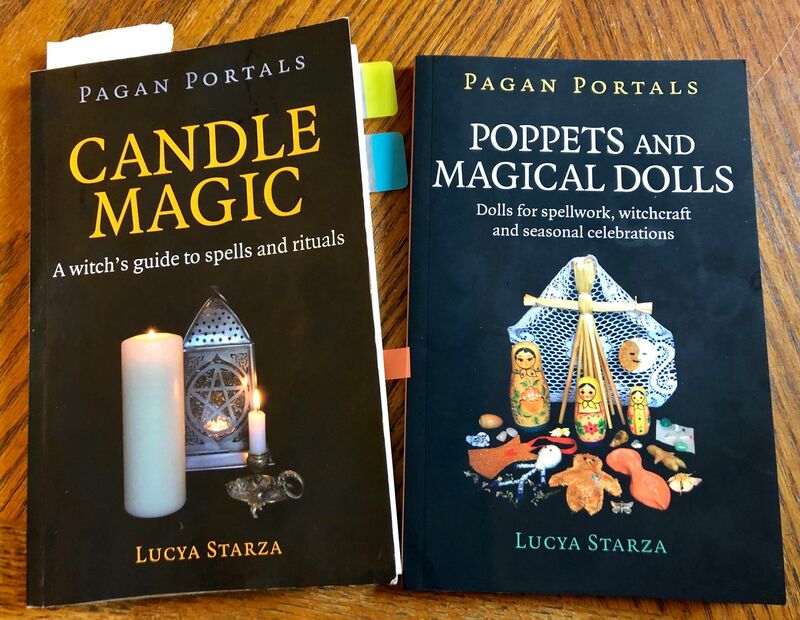 While some may not like their brevity, I rather like them and the Pagan Portals series overall because they are short – kind of like the first couple dates with a subject to find out if you like it or not. I’ve long thought the Pagan community needed a new series of books like this to be a more modern take on the old “Elements of” series. And when you want to go deeper on a subject, a good starting point is the bibliography of these volumes. My only real complaint about either book is that they could benefit from a couple well-placed illustrations or photos showing how to make some things. I worked as a technical writer for 10 years and have learned the hard way that sometimes no matter how hard you try, people will not visualize what you are saying as you intend it. Sometimes a photo can clear up confusion better than a couple hundred more words. I haven’t noticed illustrations in any Pagan Portal so far (though I haven’t read them all), so perhaps this is the publisher’s call instead of the author’s. The group study has finished Candle Magic and will start the Poppets book in January. So far, the texts have given a good foundation for people to work from, and even those of us who have been practicing for many years found some new gems. What I also like is that Starza’s books work well when you want to weave in other related information and activities. For example, the Candle Magic book touches on a way to create witch bottles that includes candles. Years ago, I lead an activity night on witch bottles and spell bottles, so this inclusion gave me an opening to pull in that information to the new ladies. Likewise, we plan to end the Poppets study with our group’s matriarch leading an activity on mawkins, a type of magical doll she is familiar with.